In this screen capture from a video produced by Fort Lewis College, Skyler the Skyhawk has new FLC President Tom Stritikus in his talons and screaming for his life. The video is a promo for Friday night’s football game against New Mexico Highlands University, which will be held at Durango High School. New Fort Lewis College President Tom Stritikus seems to be having a lot of fun heading up the campus in the sky. Since arriving on the job a month ago, Stritikus has had much face time with the community, staff and student body. Besides the giddiness of living in a new town (he came to FLC from the Pacific Northwest), he has been showing he can do business and have fun. 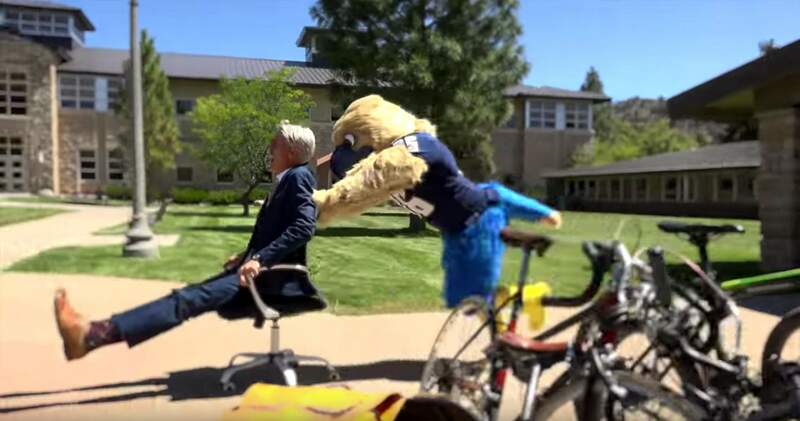 And on another day, he’s careening down a campus sidewalk in his office chair with Skyler the Skyhawk pushing him. Stritikus tries to get the college mascot to actually speak some words. But Skyler isn’t interested. Instead, he’s focused on getting the president pumped for FLC’s Friday night football game under the lights at Durango High School – he just can’t use his words. Skyler takes Stritikus to the rim to take a gander at the DHS field from afar. It quickly makes sense what he’s trying to say. Then we see what is probably the first ever Skyler/Stritikus chest bump. The bird’s got the advantage of a few pounds, though, and sends Stritikus stumbling to the ground. You OK, president?